West Jordan • Child with degenerative spinal disease to get help getting around with canine pal. 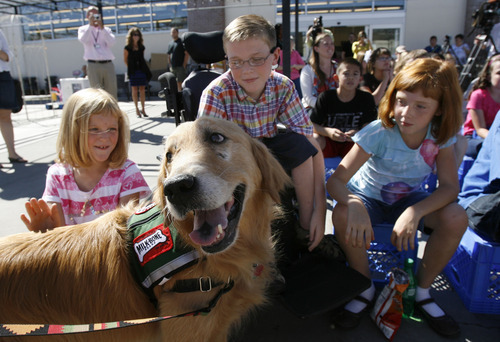 Francisco Kjolseth | The Salt Lake Tribune Carter Veldevere, center, alongside his sisters Madison, 8, left, and Jordyn, 9, meets Barnsley, a service dog, with other 6th graders from Hayden Peak Elementary. Carter, 10, who has spinal muscular atrophy, received a sponsorship from Milk-Bone and Smith's Food & Drug, and will be matched with a free service dog some time in the next year. 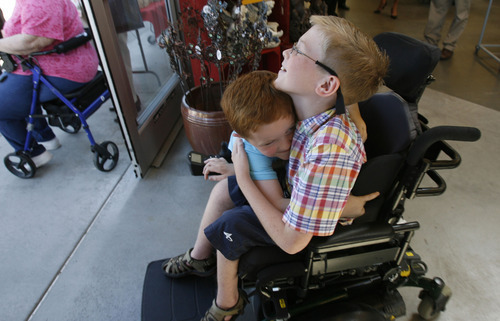 Francisco Kjolseth | The Salt Lake Tribune Carter Veldevere, a 6th grader from Hayden Peak Elementary in West Jordan who has spinal muscular atrophy, gets a bear hug from his brother Aiden, 4, during a special event at Smith's at 455 S. 500 E., in Salt Lake City on Tuesday. The 10-year-old received a sponsorship from Milk-Bone and Smith's Food & Drug, and will be matched with a free service dog some time in the next year. 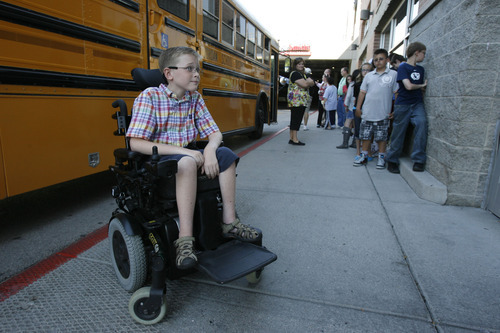 Francisco Kjolseth | The Salt Lake Tribune Carter Veldevere, a 6th grader from Hayden Peak Elementary in West Jordan who has spinal muscular atrophy, waits for a special event to begin alongside his classmates at the Smith's at 455 S. 500 E. in Salt Lake City on Tuesday. The 10-year-old received a sponsorship from Milk-Bone and Smith's Food & Drug, and will be matched with a free service dog some time in the next year. 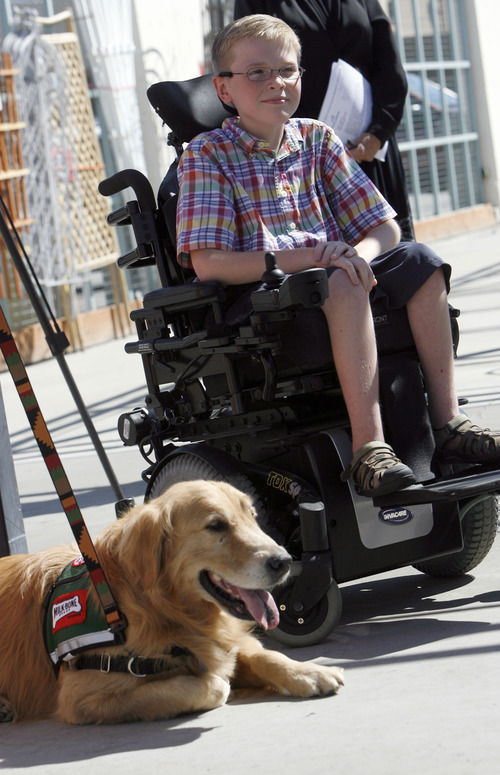 Francisco Kjolseth | The Salt Lake Tribune Carter Veldevere, a 6th grader from Hayden Peak Elementary in West Jordan who has spinal muscular atrophy, meets Barnsley, a spokesdog for non-profit Canine Assistants. The 10-year-old received a sponsorship from Milk-Bone and Smith's Food & Drug, and will be matched with a free service dog some time in the next year. Ten-year-old Carter Veldevere cannot ring a doorbell, pick up a dropped pencil or open and close a door. He's been on a waiting list for a service dog for four years. But on Tuesday, Carter's classmates, teachers and friends and family celebrated the news that Milk-Bone and Smith's Food and Drug Stores are sponsoring his request for a service dog from the non-profit Canine Assistants. "I'm very excited for my dog," Carter said. "It'll be a great dog, and I can't wait to get it." First, Carter must wait as his puppy grows and is trained on an 18-acre farm in Georgia, explained Lynn Engum, a representative from Canine Assistants. In about a year Carter will go to Georgia with his family to meet and train with the pup, which will assist him with everything from getting bottles out of the fridge to fetching help in an emergency. "They become a person's best friend. They're a forever friend," Engum said at the celebration inside a Salt Lake City Smith's store. She demonstrated the abilities of a service animal with her golden retriever spokes-dog, Barnsley, who helped pull off her jacket, delivered a water bottle and walked side-by-side with Carter. Canine Assistants trains only black and yellow labs, golden retrievers and golden doodle mixes due to their "work ethic," Engum said. They are taught with positive re-enforcement and lots of treats. The training and lifelong care of a dog is around $23,000, she said. For Carter, the cost will be covered by Milk-Bone and Smith's. He isn't sure what he's going to name his new dog, but he said he's "always liked the name Snoopy." Carter has never been able to walk. Instead, he speeds around in a power chair with a license plate that reads "2 fast 4U." At Hayden Peak Elementary in West Jordan, he works to fit in as best he can. Tim Persons, his special-education teacher, said when the students play soccer, Carter kicks the ball with his chair. When they play baseball, another student bats for him, but Carter runs the bases. The far-reaching affects of his disorder impair all of his physical abilities, but not his mental skills, said his mom, Brenda Veldevere. "He's just a normal kid in a wheelchair." His mother and his father, Mark, take shifts each night turning Carter while he sleeps. Because Carter has severe scoliosis (a curvature of the spine), metal rods were placed in his back. Every six months, Carter has surgery that adds length to the rods. Because the disease is degenerative, he eventually may lose the ability to swallow and keep his head up. "We just don't know. It's different for each child," Brenda Veldevere said. "If you had two SMA kids, they would be totally different." The Veldeveres said Carter is going to appreciate the independence that having the dog will afford him. He's excited to be able to ring the doorbell when he visits a friend's house. "This is our normal," Brenda Veldevere said. "Other people might look at us and... feel sorry for us, but to us it's normal, and he can do anything that for the most part anybody else can, just modified in a way." The Veldeveres hope for the best and plan for Carter's future. He wants to be a meteorologist; preferably, he says, a tornado chaser.